MoMA’s “Forever Now” trumpets art with a shallow sense of tradition. Yet the “Americans” exhibitions are legendary because Miller was discerning in her choices. In 1946, the second of these shows, “Fourteen Americans,” included such exponents of the new abstraction as Arshile Gorky, Isamu Noguchi, Robert Motherwell and Mark Tobey. Among those in “Sixteen Americans,” in 1959, were Jasper Johns, Ellsworth Kelly, Robert Rauschenberg and Frank Stella, not to mention the West Coast assemblagists Jay DeFeo and Wally Hedrick; and the last in the series, “Americans 1963,” included the budding Pop artists Robert Indiana, Claes Oldenburg and James Rosenquist among the fifteen selected, as well as young and older abstractionists such as Lee Bontecou and Ad Reinhardt. Miller decided to start the series because she’d realized that there was no other way for many artists, in the New York of the 1940s, to get their work seen. “I had this terribly sad job of seeing all these artists who were starving,” she later said. “There were no galleries to send them to.” By the mid-’60s that was no longer true. Accompanying the emergence of Pop Art was a boom in the market for contemporary art, and the number of galleries mushroomed along with it. Fifty years on, New York is so thick with galleries that it’s impossible to immerse yourself in all of them, and so many cities around the world have thriving gallery scenes (and art fairs) that you couldn’t possibly visit them all. Maybe the museum should be the public’s filter again—surveying all the galleries and selecting the best work for an audience that wants to explore contemporary art without hacking a path through the jungle. Except that the population of artists has increased even more rapidly than the number of galleries, so that there are still plenty of talented artists whose work is hard to see even for die-hards of the scene. One of the current shows at the Museum of Modern Art (through April 5) could have been called “Fourteen or Fifteen More-or-Less Americans, Three Germans and a Colombian Who Lives in London.” That’s an unwieldy title, but also as accurate and straightforward as it could be. The “More-or-Less” would be necessary because the show includes some foreign-born New Yorkers, and the qualification also has the virtue of not pretending that the exhibition is other than it is: a gathering of “distinct and widely varying personalities” with not much more in common than that they’re all at work right now and the curator (in this case, MoMA’s Laura Hoptman) thinks they demand attention. Sad to say, MoMA has done something different: it has saddled the exhibition with the unjustified goal of thematic coherence. With good reason, the museum has lost faith in its competence to pick the cream of contemporary painting without ulterior rationale. What’s on offer instead is another nebulous effort to take the temperature of the zeitgeist. But guess what? It’s the zeitgeist of no zeitgeist, so anything goes. The show is called “The Forever Now: Contemporary Painting in an Atemporal World,” and, according to the museum’s press release, the remarkable thing about the works is that “they paradoxically do not represent—either through style, content, or medium—the time in which they are made.” How is that even possible? Hoptman, in her catalog essay, attributes the word “atemporality” to the science-fiction novelist William Gibson, for whom it means “a new and strange state of the world in which, courtesy of the Internet, all eras seem to exist at once.” But long before the invention of the Internet, Jorge Luis Borges imagined an infinite library in which all the books that could ever be written would already exist. What’s new and odd is the urge to characterize a phenomenon of apparent timelessness with the distinctly temporal designation “new.” Neo retro, anyone? In any case, the feeling hazily conjured at MoMA is far from new. “All ages are contemporaneous,” Ezra Pound wrote in The Spirit of Romance in 1910. He might have seemed, at the time, to be speaking for the great cultural movement about to emerge—for James Joyce, with his layering of classical myth and the profane reality of early-twentieth-century Dublin in Ulysses; for Picasso, whose postwar art of pastiche seemed to disassemble and recombine historical styles just as his earlier work had taken apart and reconstructed pictorial space; for Stravinsky, whose music had found a sense of modernity in both primitive ritual (The Rite of Spring) and the mincing artifices of the eighteenth-century ballroom (Pulcinella), and who sought for his Oedipus Rex “a medium not dead but turned to stone.” And decades later, the postmodernism of the 1980s—above all in architecture but also in the quotationism of neo-Expressionist and “transavantgarde” painting—sought atemporality with a vengeance. For Hoptman, all this history is bunk. “Forever Now” does not mean, as it did for Gibson, that “all eras seem to exist at once,” but that the present is all, and no one knows when that is. Her only point of comparison is with the practice of “appropriation in the 1980s,” by which she presumably means Sherrie Levine’s quotations of famous photographs or Richard Prince’s Marlboro Man. She might have thought back to the 1960s and Elaine Sturtevant’s remakes of works by contemporaries like Andy Warhol and Jasper Johns, the subject of a retrospective elsewhere at MoMA (“Sturtevant: Double Trouble” is on view through February 22). Levine, Prince and Sturtevant are the artists who, as Hoptman says, “lifted images and styles from art history and pop culture and dropped them in the arena of contemporary art as if they were toxic ready-mades, stripped of their auras of power and persuasion through decontextualization.” By contrast, according to Hoptman, her atemporalists draw on history guiltlessly, one might even say uncritically. Maybe so, but wouldn’t she say the same of artists as different as Nancy Spero, Francesco Clemente and Julian Schnabel, each of whom has ranged through time and space in pursuit of the sources of his or her art? If anything, Hoptman’s artists du jour have a shallow sense of tradition. One of Richard Aldrich’s paintings has a certain redolence of the Philip Guston of the early ’60s; Matt Connors is showing a twelve-foot-tall triptych of red, yellow and blue monochromes that can’t fail to remind you of Ellsworth Kelly and Barnett Newman; Nicole Eisenman’s stylized heads have discreet echoes of Paul Klee and Alexej von Jawlensky as well as of the ’80s neo-Expressionists themselves; Mark Grotjahn’s densely layered concatenations of shimmering, thickly textured lines recall Joseph Stella’s Americanized Futurism as reinterpreted by way of Richard Pousette-Dart’s hypnotic tactility; Amy Sillman sometimes uses still life as an armature for abstraction in ways that would not have seemed alien to Hans Hofmann; Rashid Johnson and Julie Mehretu draw very different conclusions from Cy Twombly—in Johnson’s case, an influence productively united with that of the matterism of ’50s Europeans like Antoni Tàpies and Alberto Burri. I could go on, but you get the point: for inspiration, Hoptman’s atemporalists rarely look beyond European and American modernism, and most often postwar modernism—which is not surprising, because most of them are abstractionists. Less easily explicable is the restricted geographical reach of Hoptman’s choice in an era when ideas, like people, pass so easily from continent to continent. The time traveling behind Spero’s fascination with the archaic or Clemente’s with Indian miniatures or Schnabel’s recourse to the religious iconography of Spanish and Mexican Catholicism—this is absent from “The Forever Now.” As it is, the best paintings in the show are the least dependent on citation: in a set of gloriously luminous works, depicted light is confronted with the literal light of bent neon tubes that Mary Weatherford has stretched like drawn lines across the canvas. Almost miraculously, it’s the depicted light that wins out. What MoMA has offered is hardly a state-of-the-art report on painting in an age when the Internet has supposedly made all the information in time and space available to us simultaneously. But how would the exhibition look to the innocent viewer who walks into the museum without reading the catalog or text panels or giving a second thought to the title? How would it be, in other words, for the viewer who sees the show for what it really is, a sort of “Seventeen Mostly Americans”? A little better, but not a lot. The usual MoMA tendency to shoehorn too many works into too little space is partly to blame. At least Kerstin Brätsch is lucky enough to have her massive “Blocked Radiant” paintings on paper installed in the hall outside the show’s first room, where they can breathe a little; and the strongest of an otherwise thin batch of paintings by Laura Owens, combining silk-screened appropriated imagery and freehand gesture, broadcasts loud and clear from the wall above the ground floor ticket desk. But in the rooms housing the bulk of the show’s art, the works elbow each other irritably. More important, Hoptman’s choices are questionable—not only her selection of artists, but also her selection of works by some of them. Eisenman, Grotjahn and Sillman are among the most interesting painters at work today, but the canvases of theirs on view give little sense of their range and adventurousness. Owens, Aldrich and Brätsch, like Charline von Heyl and Josh Smith, have always been hit-or-miss (in Smith’s case, where Stakhanovite productivity is the name of the game, the misses must number in the thousands, and for all I know maybe the hits do too), and while a daring inconsistency is often in itself attractive, the selection here makes it less so. I owe to Roberta Smith’s New York Times review of the exhibition the “demographic detail”—which I have to admit I’d overlooked—that almost all the male artists in the show are younger than almost all the women. That tells us something about time and history that Hoptman’s notion of atemporality leaves out: that men can still find institutional and market acceptance far more quickly than their female peers. I’m getting sick of it. Unfortunately, Smith, who certainly knows better, falls into the trap of pitting women against women, pointing out some midcareer women painters who she feels might have been worthier inclusions than those in the show. More to the point would be to mention the young women artists who might have been there instead of the young guys. Sticking to New Yorkers, I’d trade Bradley and Williams for Amy Feldman, Julia Rommel, Kianja Strobert or Wendy White any day. What “The Forever Now” fails to offer is painting that, in its curator’s words, is “inspired by, refers to, or avails itself of styles, subjects, motifs, materials, strategies, and ideas from an array of periods on the art-historical timeline.” To see such work, amble downtown to the New Museum, where Chris Ofili’s midcareer retrospective “Night and Day” is on view through February 1. Although Ofili, now in his mid-40s, is one of the most prominent figures in the British art scene (despite his having deserted London for Trinidad), New Yorkers still probably know him best, unfortunately, for the 1999 controversy over the Brooklyn Museum show “Sensation: Young British Artists From the Saatchi Collection.” There, Ofili’s 1996 painting The Holy Virgin Mary became an object of extreme contention; like most of his paintings at the time, it used elephant dung as one of its materials. It was denounced in the pages of the Daily News, then by the Catholic League and Mayor Rudolph Giuliani, who threatened to cut off municipal funding for the museum and evict it from its city-owned building. Catholic groups picketed the museum, and the painting itself was eventually vandalized by a protester who smeared it with white paint—the black Madonna had to be whitewashed to be made less offensive—though conservators were able to successfully remove the paint before it dried. Around the middle of the last decade, Ofili’s art suddenly changed. Out went the elephant dung, the glitter, the riotous patterning, the map pins, the often raw and attention-grabbing subject matter—though the religious overtones remained. What came in is harder to characterize, and that seems deliberate. In 2005, Ofili moved from London to Port of Spain, Trinidad. To some degree, the move seems to have been a calculated effort to distance himself from the London art scene, where he had become the object of attention and where he was rapidly becoming something like an establishment figure. He’s chosen rural life over his urban origins, but also a locale where, as a foreigner who is black, he can blend in, becoming an observer who looks on from close quarters without attracting attention. Strangely enough, some of Ofili’s more recent works all but rebuff the viewer’s attention. The “Night” segment of “Night and Day” is a group of paintings done mostly in shades of blue, and shown in a room with dark walls and lowered lights. Even after your eyes adjust to the darkness, it’s still hard to detect the forms in the paintings. One depicts the hanged Judas; another, a man set on by policemen. In a few cases, I was never quite able to tell what it was I was trying to see. But even in other recent paintings that are not so hard to decipher, the imagery can be difficult to interpret. 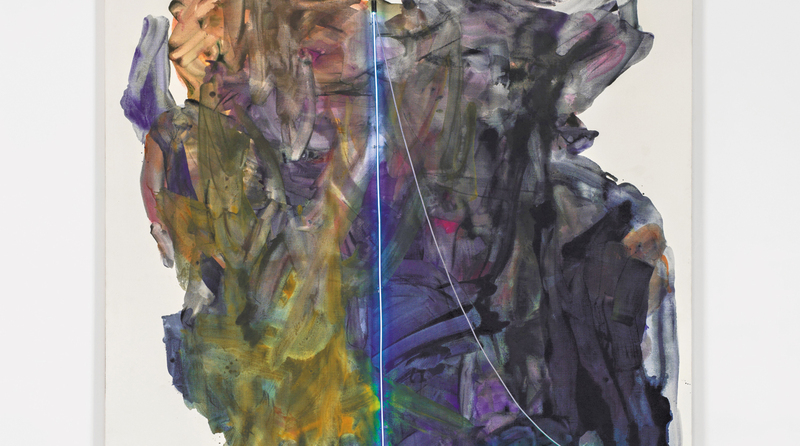 Ofili seems to evoke what might be a coherent narrative or at least a metaphor, only to dissolve it into ambiguity. Stylistically, too, his reach has become broader, more unpredictable. Robert Storr, in his catalog essay for the New Museum, notes that “the work’s pictorial frame of reference has changed dramatically from that of the earlier works to a sleek, semisilhouetted semiabstraction reminiscent in some respects of the cutouts of Henri Matisse, and in others of Art Deco murals, while evoking the fusion of these influences in the marvelous rhythmic hybridity of Romare Bearden’s collages and prints.” Tribal art is recurrently evoked too. Ofili’s subject matter ranges from biblical tales to Greco-Roman myth to Afro-Caribbean folklore to the artifice of daily life in what is also, after all, a tourist destination. He seems to be questioning, more and more, who he is—what he’s made of and what he cannot absorb. He doesn’t always succeed in making his images and influences cohere, but his self-questioning has its own coherence that transcends mere thematic or even pictorial consistency. It’s a communion with the unknown.